Frank King addresses RMC students in Losekamp Hall. Photo by Megan Logan. Mental health issues and suicide are not uncommon on today’s college campuses. 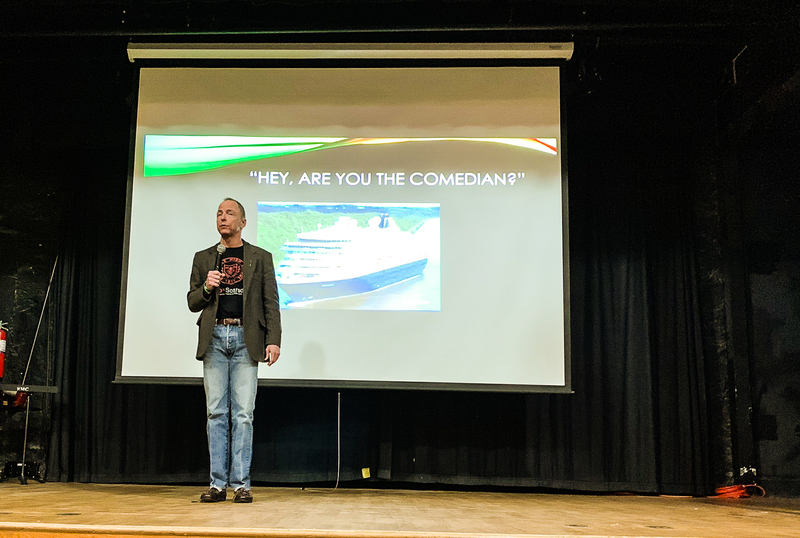 In order to spread awareness on mental health and suicide prevention, the Stand Up RMC program invited speaker Frank King to Rock Mountain College on Jan. 23. King was chosen to speak to students, not only because of his own experiences with suicide and depression, but because of how he delivers his speeches. The TED talker and former writer for “The Tonight Show” adds comedy to his public appearances in order to ease tension. King believes laughter saves lives. King informed the students and faculty in attendance that mental illness and suicide run in his family. He lost his grandmother and great aunt to suicide. At the time of his aunt’s suicide, King was just 4-years-old. King had decided to focus his TED Talk around suicide and mental health after speaking with a woman on a cruise ship who attended one of his acts. King explained to the audience that all it takes to save someone is to start an honest conversation with them to find out how they are really doing. While King noted that starting the conversation can be the hardest part, it is absolutely necessary in saving someone’s life. When confronting a person who you believe is depressed, King said you have to start by asking “How are you?” followed by making sure you are getting the full answer. If you discover they are depressed, you ask them if they have had thoughts of suicide. If they admit to having such thoughts, ask them if they have a plan to take their own life. If the person being confronted does have a plan, they should not be left alone under any circumstances. King explained that 8 out of 10 people contemplating suicide are ambivalent about it, meaning they can potentially be talked out of doing it. There are always the 2 out of 10 that are determined to take their own lives, but there are so many people that can be saved. King also stated that people can call the police to do welfare checks on someone. In many states, if the police are called to check on someone who is contemplating suicide, they will take them into custody. According to Psychology Today, almost 50 percent of college students had a psychiatric disorder within the past year and 73 percent have had some type of mental health crisis during college. To put those numbers into perspective, based on the fall enrollment number of 997 students, if 73 percent of that number had a mental health crisis, that would be 727 Rocky students. If 50 percent of our campus had a psychiatric disorder, that would be 498 students. If you or someone you know is struggling wit mental health issues, or suicidal thoughts, please reach out. RMC’s Licensed Clinical Social Worker, Cynthia Hutchinson, can be reached at 406-657-1049. Other mental health resources are available on Rocky’s website by searching “Mental Health.” The National Suicide Prevention Lifeline is 1-800-273-8255 and available 24 hours. If you or someone you know is experiencing an emergency, please call 911. This entry was posted in Feb 2019. Bookmark the permalink.